Combine yeast, sugar and warm water in a bowl and stir until dissolved. Let rest about 10 minutes. Add oil, flour, salt and 2 eggs. Mix well. Knead dough, 5-10 minutes, until it becomes elastic and springy to the touch. Roll dough into a ball, coat with a small amount of oil, cover bowl with a towel or plastic wrap and leave in a warm place for at least one hour until dough Is about doubled in size. Divide dough for loaves or rolls. 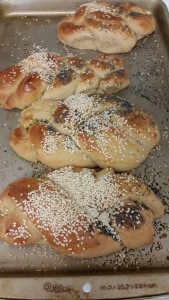 Then divide into equal sized balls, roll into ropes and braid or twist into loaves or rolls. Beat remaining egg and use a brush or paper towel to coat the outside of each loaf or roll. Sprinkle with seeds, if using, and bake at 375F until brown on the outside and bottom, about 35 minutes for loaves, 20 for rolls.